Being Frugal and Making It Work: Purex Baby Detergent (Review & Giveaway) - 3 Winners! 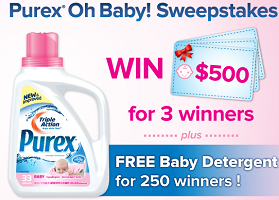 Be sure to enter the ‘Oh Baby!’ Detergent Sweepstakes and let Purex help cover some of those baby expenses. Three grand prize winners will each receive $500 plus 250 additional winners get FREE Purex Baby detergent. Purex Baby is not available in all stores, so be sure to check out their store locator to find a store near you that carries Purex Baby laundry detergent! This giveaway will end January 16th at Midnight EST. Disclaimer: I received a complimentary bottle of Purex Baby Detergent as a member of Purex Insiders for the purpose of writing a review and hosting a giveaway. Regardless, I only recommend products or services I use personally and/or believe will be a good fit for my readers. The views and opinions expressed on this blog are purely my own. Results may vary. No monetary compensation was received. Purex Crystals! I use them in every load of laundry. I like Purex with Oxi. My favorite is their Free & Clear Detergent. I really love Purex Crystals! I like Purex Plus Oxi. love the free & clear line, great for my kids who have eczema! Oh I love the Purex plus Oxi! I love the scent yet its hypoallergenic for my son! So glad they made a baby one now! We use Dreft for Carter, buts its so expensive...cant wait to try the new Baby one for Carter! I love the Free and Clear because I have sensitive skin, and probably so will baby when she comes! I like the Purex Crystals best. Purex oxi would be great to try. 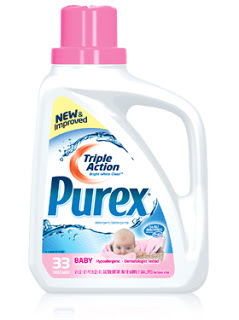 I love that Purex has baby detergent! I like Purex Free and Clear because we all have sensitive skin.